Do you know about Android 8.0 Oreo ? You can now have latest android version 8.0 called Oreo installed on your smartphone, it is designed with many features to support good performance on Android Phones. Oreo OS is Smart, fast, more powerful and sweeter than ever. The world's favorite cookie is your new favorite Android release so try to install on your phone to enjoy better performance. Android 7.0 Nougat is one of the trending OS in the market supporting better performance of android phone not until the release of the latest Android 8.0 Oreo which has better features, 8.0 Oreo is design to be smart , fast and enhance good performance. Google had released the final version of Android 8 Oreo, which is the latest version of Android, last month. The company, after rolling out the new software said that the Pixel and Nexus phones would be the first devices to get the software update which was later extended to other smartphones, Android One is one of the phone that will be coming up with Oreo update. Latest Android 8.0 Oreo Features. 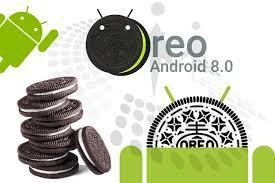 Enjoy best Android performance with latest OS version 8.0 Oreo, it is smarter, faster and allow you to perform many task side by side.